This will be the map of your heart, old woman. In an ancient time, in a faraway land, a young woman named Aoife is allowed a rare apprenticeship to become her kingdom’s mapmaker, tasked with charting the entire domain. Traveling beyond its borders, she finds a secretive people who live in peace, among great wealth. They claim to protect a mythic treasure, one connected to the creation of the world. When Aoife reports their existence to her kingdom, the community is targeted as a threat. Attempting to warn them of imminent danger, Aoife is exiled for treason and finds refuge among the very people who had been declared her enemy. With them, she begins a new life surrounded by kindness, equality, and cooperation. But within herself, Aoife has no peace. She cannot share the grief she feels for the home and children she left behind. She cannot bear the warrior scars of the man she comes to love. And when she gives birth to their gifted daughter, Aoife cannot avoid what the child forces her to confront about her past and its truth. On this most important of journeys, there is no map to guide her. In this tale—her autobiography— Aoife reveals her pain and joy, and ultimately her transformation. 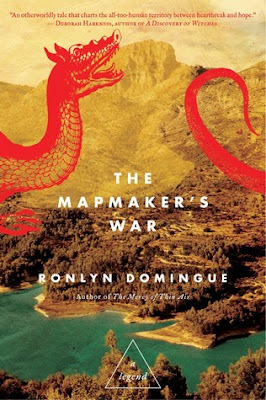 The Mapmaker’s War is a mesmerizing, utterly original adventure about love and loss and the redemptive power of the human spirit. Watch for its epic sequel, The Chronicle of Secret Riven, in 2014. I have to say when a story can have me thinking about it even days and weeks after I read it, I know it's good. This is exactly how I felt after reading, The Mapmaker's War. Now, this doesn't mean while reading it I felt the same way, because the beginning of the book took some time getting use to the story and the main character, but after a few chapters in I was completely drawn. This was such a great story told from the second person's point of view. I felt very connected to Aoife, the main character and loved how vivid all the details about her surroundings were. I could close my eyes and actually picture everything that was going on and where she was and that's what makes this book pretty great. This is an inspiring story that I think every young girl should read. It shows you how strong, honest and true one can be without changing despite what others think. Such a great read, I'm looking forward to the second installment! Disclosure: All opinions are my own. I received The Mapmaker's War at no cost for the purpose of this review. No other compensation was received.